They weren’t all much better in my day. On the whole they were worse. Sure, the great would be great in any era – just great in a slightly different way. But the second-raters are much better these days and there are a lot more of them; third-raters don’t last long anymore and fourth-raters have gone extinct. The 40-run difference between the averages of Don Bradman and Sachin Tendulkar doesn’t illustrate their difference in batting greatness; it shows the difference between the ordinary bowlers of Bradman’s time and those of more recent years. Bowlers are fitter, faster and stronger, and what is more, they last longer; batsmen, especially attacking batsmen, are stronger and more skilled than ever before, playing strokes their predecessors never dreamed of, scoring at rates once impossible and hitting the ball a great deal harder and further. As for fielding – well, anyone remember the clumsy galoot who used to stop the ball at third man with a big boot before bowling the ball in – with a locked elbow – to save his arm? But one skill in the game has declined – and declined sharply. 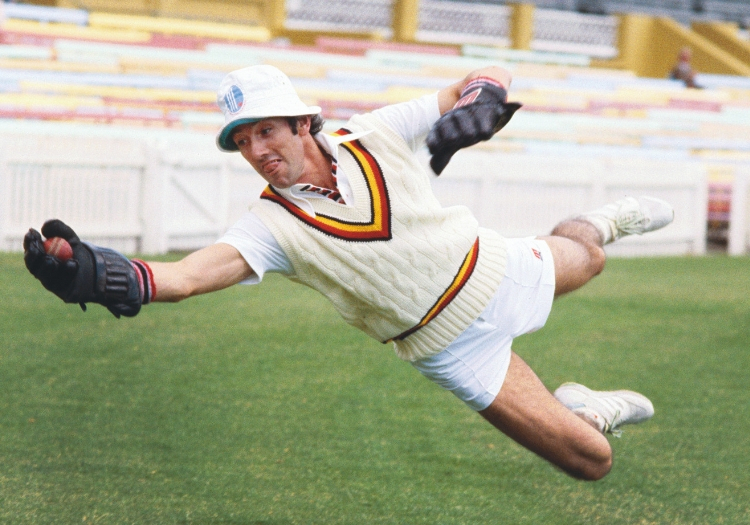 And that is wicketkeeping. The idea of playing a proper wicketkeeper is out of fashion, never mind the dropped catches and the missed stumpings, they don’t show up on the stats. But you can count the runs all right. He spoke those words to me at, I think, Derby, where he was good enough to give me an interview. He was still playing for England, but even then, that sense of stumpers’ craftsmanship was beginning to sound old fashioned. Craftsmanship, did I say? 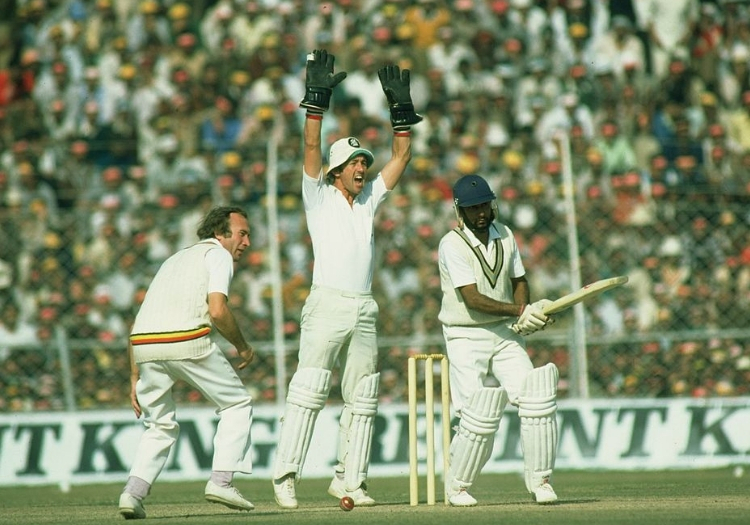 In 1977, when Taylor was one of the Wisden Five Cricketers of the Year, his citation spoke of his “artistry – there is no other word for it – behind the stumps”. And that artistry is something I have always rejoiced in. I was a dodgy keeper myself at village green level; my desperation to do well made my hands rigid as a couple of planks. I dropped catches, I got sore palms. And I loved watching Taylor showing me how it should be done: ball arriving in his hands soft as an alighting dove. He took the padding out of the palms of his gauntlets, and cut off all the webbing as well: he valued the feel of the ball far above any protection the gloves might offer – and besides, if you take it right, it doesn’t hurt. Apparently. Does it matter that you can hear the slap of ball into glove from the boundary when modern keeper/batsmen are at work? The ball whispered into Taylor’s gloves, the timing, the give of the hands, the extraordinary affinity between the player and the thing played: did that make cricket a better game? Or was it mere decoration? Or a catch off Middlesex’s Mike Smith from the bowling of Mike Hendrick: a wide off-side ball that took the inside edge and fizzed down the leg side. Taylor changed direction in mid-air and took it. It is the standing up that counts, of course. 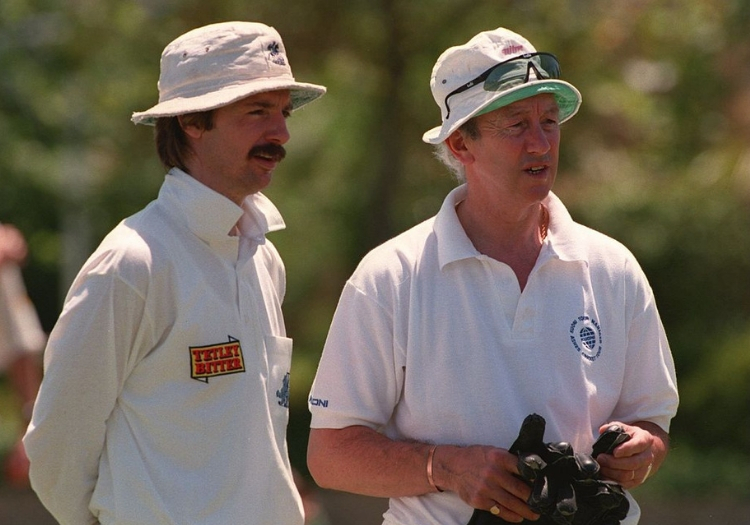 “I judge a wicketkeeper by the way he stands up. Standing up shows if you are wicketkeeper or a backstop. Any decent slip fielder could do it standing back,” Taylor said, though the concentration, the need to take every single ball, whether or not it goes past the bat, requires a good deal more mental ability – and physical fitness –than being a slip fielder. 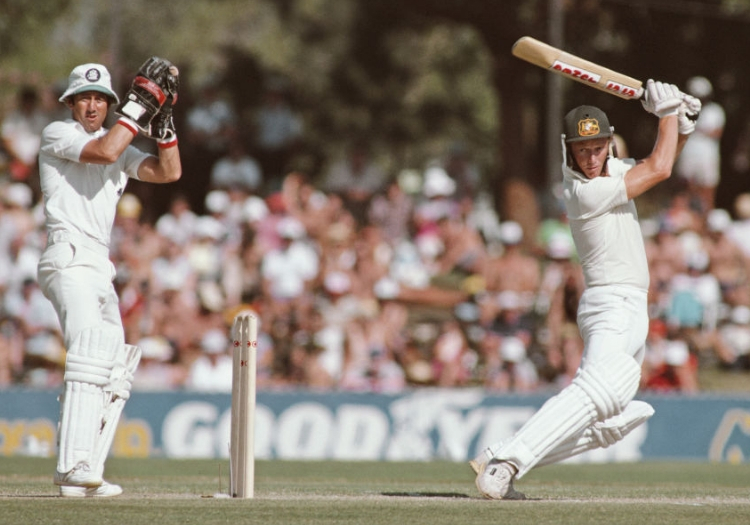 "The ball whispered into Taylor’s gloves, the timing, the give of the hands, the extraordinary affinity between the player and the thing played: did that make cricket a better game? Or was it mere decoration?" Taylor loved above all else the duet with the bowler, standing within touching distance of the batsman as ball nestles into his gloves after the play and miss – and that silent take makes it all so much worse for the poor batter. It shows that the keeper as well as the bowler is outplaying him. Then comes that glorious feeling of shooting someone in the back when the stumping chance comes along, the batsman in error, you the wicketkeeper, reactive, creative and perfectly destructive. Taylor revelled in the role of the humble craftsman. I suspect that part of him was relieved to be out on 97: a century would have been presumptuous, out of order, thrusting himself forwards. Taylor had no ambition to be Prince Hamlet: he was happy to be an attendant lord: to play a role that no one else really understood, but which they all – bowlers especially – deeply appreciated. In some matches a batsman is the star, other matches it is a bowler: but every game you ever play, the wicketkeeper is merely indispensable. There is a subtle kind of glory in that. I have watched brilliant horse riders across all the sporting disciplines and admired them all – and every now and then you find one – not necessarily the most successful – whose affinity with the horse is so deep and easy and so utterly unforced that the horse seems to do what the rider wants without needing to be asked, still less coerced – Mark Todd, the eventer, Bill Shoemaker, the American jockey. The great keepers seem to have the same kind of relationship: a perfect affinity between gloves and ball. I don’t know if it helps teams win more matches, but it is certainly a delight to watch. Ben Foakes in Sri Lanka, standing up to Jimmy Anderson, was a splendid sight, shame he never managed a stumping, though it would not have been the wicket the old fellow cherished most in retirement. Sarah Taylor is another example. You can love a task for the joy of mastering it, and you can love a task for itself, for the love of the process. And that is what Bob Taylor had as a wicketkeeper. Players are by necessity caught up in the uncompromising task of trying to win. The brutal simplicities of this standpoint are essential to the quest for victory. But spectators are not bound by this creed, even though we must all understand it. Those who watch can look for other things as well: that is our great luxury. And those who have the taste for it can, in the rare times they come across it, revel in the stately gavotte, the perfect duet of ball and keeper, so that the ball leaps gratefully into the gloves, not by some prodigious and obvious effort, but because it was – or seemed –preordained. That was Taylor’s artistry. Not that he’d put it that way himself: but occasionally you find craftsmen of such high skills that what they create demands the name of art. If he had kept wicket in gloves of white silk he could not have made it look more beautiful.